SUPER DURABLE - The stainless steel connector heads slot in easily and steadily, and won\'t get loose or fall out from your devices as your normal micro cables. STYLISH NYLON BRAID - Nylon braided cord is tangle free and robust promises you a perfect experience in charging your devices, Tested 10002 + bending Life. PERFECT COMPATIBLE - USB Type C Cable can fast charge and sync well with Samsung Galaxy S9 S8 Note 8 LG V30 V20 G6 G5 Moto z Moto z4 Google Pixel XL Nintendo Switch and More. 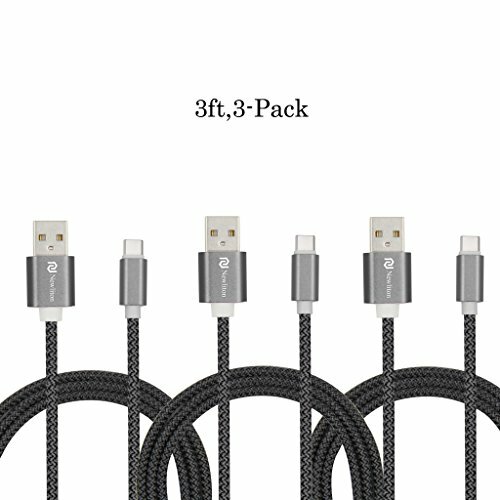 18-MONTH WARRANTY - We provide this 3.3ft USB Type-C Cable with 18-Month Warranty and 26 hour customer service, if you have any questions.